Makita’s new heavy-duty 36 volt cordless circular saw is now on shelves at KMS Tools! Rugged, powerful and loaded with features, this 7-1/4″ cordless circular saw is designed for construction professionals. With its rear handle, helical gear drive and twin battery packs, it stands out visually from other cordless circular saws. It also stands out in several key performance areas: power, cutting capacity and runtime. This saw features a Makita BL Brushless motor that spins at a brisk 5,100 rpm and cranks out enough torque to handle cross cuts and rip cuts. In addition, the saw is equipped with Automatic torque Drive Technology (ADT), which adjusts torque and speed in real time, while you cut. So this saw is both more powerful and smarter than your old cordless circular saw. It’s also a bit heavier, tipping the scales at 12.4 lbs with two 5.0 Ah battery packs (11 lbs without batteries). That’s lighter than Makita’s corded hypoid saw (13.2 lbs) but heavier than most cordless circular saws, which usually weigh between 7 and 9 lbs with a battery pack. A magnesium blade guard and shoe help keep the weight down, and the saw ultimately delivers steady and controlled cuts. Also, this saw has an electric brake and a soft-starter that gradually brings the saw up to speed. Since this saw uses a 7-1/4″ blade, its cutting capacity compares to a corded circular saw. According to the specs, the DRS780Z cuts up to 2-9/16″ at 90 degrees, which means you can slice through a piece of 3″ lumber in one pass. Since its brushless motor runs cooler than a standard brushed motor, it’s more efficient—delivering more power for its weight. When used with two 5.0 amp hour battery packs, the DRS780Z can make up to 558 cross cuts in 2x4s. Right now we have the DRS780Z on sale for an outstanding price. 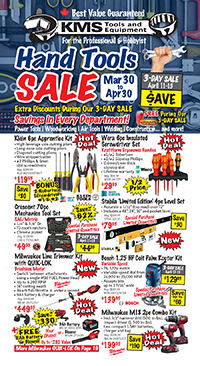 Stop by a KMS location today for more details or peruse our flyer to find deals on tools and equipment in every department. This entry was posted in Construction, Cordless Tools, New Tools, Power Tools and tagged cordless tools, Makita, new tools, Power Tools, tool technology by Your Friends in the Tool Business. Bookmark the permalink. Is it available now and how much? Thank you for checking in about the DRS780Z. It is available and currently in-stock at all our stores. Unfortunately we can’t advertise the price online. It’s a cool saw, though, and worth a visit to your nearest KMS Tools location. ← Previous Previous post: Makita DLM431Z 36 Volt Cordless Lawn Mower Is Here!